bernd nurnberger – cocreatr | be you. I met Bernd via Seth Godin’s Triiibes. How wealthy I became. Bernd is brilliant and generous beyond words. second official time.. add Jim in the mix and Bernd recording..
Edchat first virtual meetup on Junto from Bernd Nurnberger on Vimeo. Bernd blogged about this plan. amazing.. will be very cool to document/tag conversation. the goal is to get more value out of live energetic conversation that builds collective intelligence, as Venessa and collaborators envisioned in the Junto concept. then tonight… a smattering of people.. like a drop in party.. no recording.. just a lot of testing. and laughing. thank you @giftedteacher, lauren, aimee, maddie, keaton, amy, toni, @wrathofmobius, liz, seth, @gcouros, @hassl2325, @lasic, and mr4 for giving it a go. 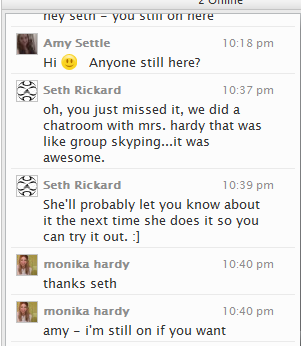 i hollered everyone up via the link on twitter or skype, most kids i texted and had them go to talk.ed chat for the link. when we got done.. found this on talk-ed. He’s been a part of some of our global webinar presentations..
and is a continual resource of love and wisdom.